If your patio area could use an update, enter the Marzetti Backyard Barbecue Contest which runs through the end of July 2009. Grand prize winner to be announced in August. You’ll find coupon codes on the back of the various salad dressings and also on the slaw dressing which is the most popular slaw dressing in the United States. With 30 different dressings, there’s bound to be one that you’ll love. This is an old product, dating back to 1896 when Teresa Marzetti started making her own dressing at her Italian restaurant. Some of the varieties are kosher too. 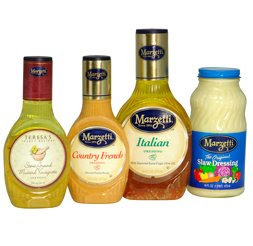 If Marzetti isn’t sold in your area (give your grocery store manager a hint about that), but you can click on the “don’t have a code” button online or send in a snail mail request for a code. In addition to the grand prize winner, there will be a daily instant prize winner. You just go to the web site and play a game that’s basically like scratching off a prize card to see if you’ve won or not. So, what you are you waiting for? You can’t win if you don’t enter. For more details, see the Marzetti contest page.